For those of you who have run Bognor Regis 10k this is a similar event, but on a larger scale. The race starts and finishes on the sea front in the centre of Worthing. There is no onsite parking so you ned to allow time to find free parking in the street or pay to par in a town centre car park. There is a race village at the start/finish selling a range of products as well as food, drink and ice creams. It’s close proximity to the beach makes it a great venue for a family day out. The course starts along the promenade and then goes through residential areas close to Worthing town centre. From there its back out towards the beach front and past the beach huts. It’s a flat course so good for a PB. There were 2800 runners this year, so you need to pick your starting point wisely to avoid bunching up at the beginning. The race finishes in the race village on the sea front. Numbers are sent out in advance and you can also buy a t-shirt. I booked just days before and received everything in a timely manner. There is a good bag and a medal for all finishers. 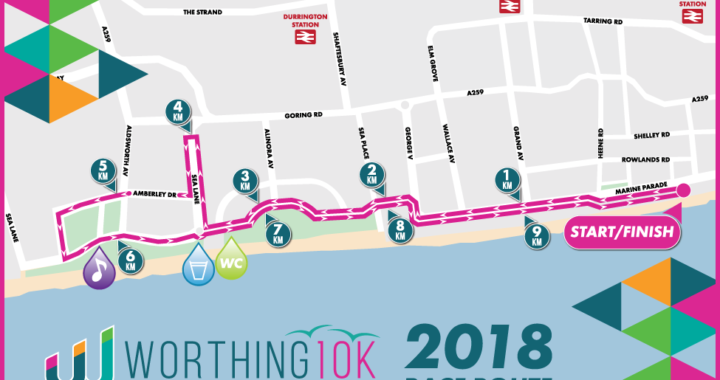 After the race you can visit the shops and attractions in Worthing town centre. I would definitely recommend this event but given the distance it might be wise to car share.